EquiGym produces a High Speed Treadmill which is surpassed by no one. These powerful machines allow for all weather training, from a 10 degree hill climb to full racing speed, on a surface that is consistent and forgiving. EquiGym High Speed Treadmills are known for their durability, stability, ease of use, speed, degree of incline, and monitoring capabilities. This very useful machine has become the most popular conditioning and labor saving tool for horsemen since the development of the hot walker. In fact, the EquiGym Horse Exercisers have replaced old style hot walkers, slow, walk/trot treadmills, and the need for hand walking or ponying. Weighing horses daily, when in training, is as important as exercising them. How fast a horse recovers his weight after strenuous exercise or work will tell the trainer how effective their training and nutritional programs are in developing their horse's ability to reach their peak performance potential. Equine stocks are a safe and convenient way to contain a horse while therapy is administered, wounds are treated, IV's are administered, mares are palpated, whirlpools are used, etc. EquiGym manufactures a large capacity wheelbarrow that is specifically designed for use in horse barns. 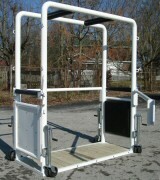 EquiGym distributes the Aerohorse Plastic Stall Gates. They are safe, attractive, durable, lightweight, with a lifetime warrantee. Custom made full and half roof structures can cover just about anything. Sub Surface Grid is an interlocking soil stabilizing drainage block that will alleviate mud holes or soil trenching effects in areas of high traffic.